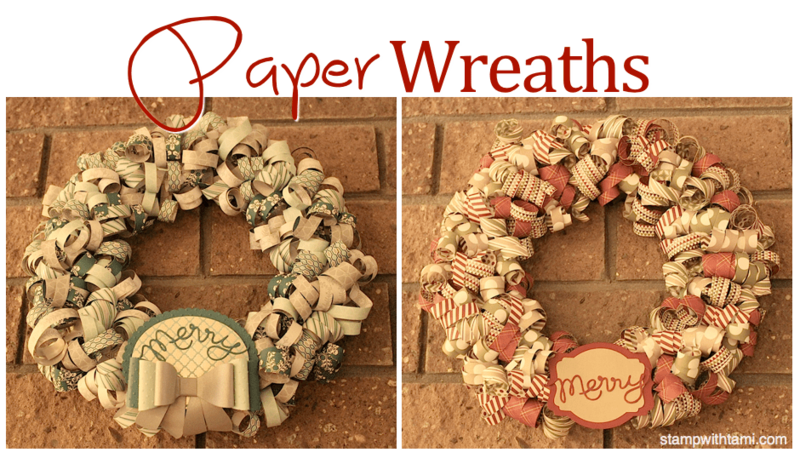 These paper wreaths are all the rage right now, beautiful home decor. Whether for Christmas Decorations, gifts or Halloween, Valentine’s day or everyday decorations, you will love how fun and easy they are to make. See my quick video tutorial for easy instructions. Scroll for different variations and the supplies used on each. 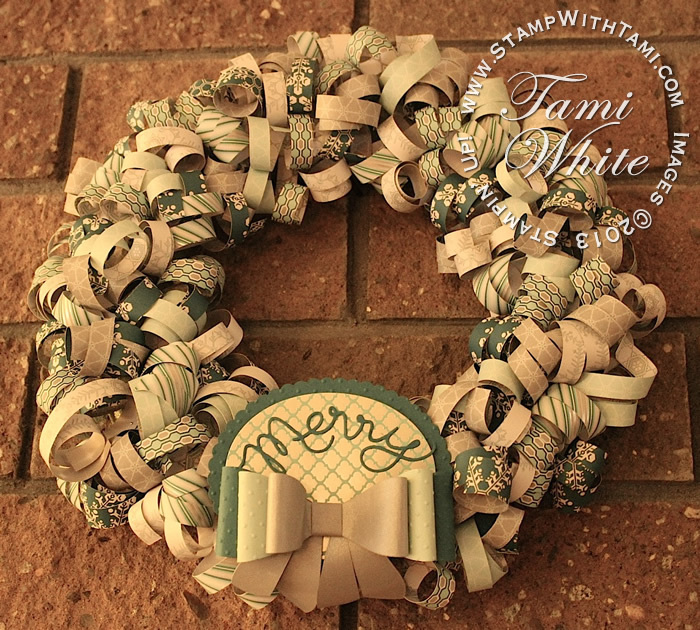 Tami…I love this wreath! and your videos are so fun! thanks for sharing! I want to be cute like this when I grow up to be a ‘real’ Stampin Up lady!!! the wreath looks like it would be fun to make will take me little time but I’, going to try it! These wreaths are wonderful, thanks for the video! 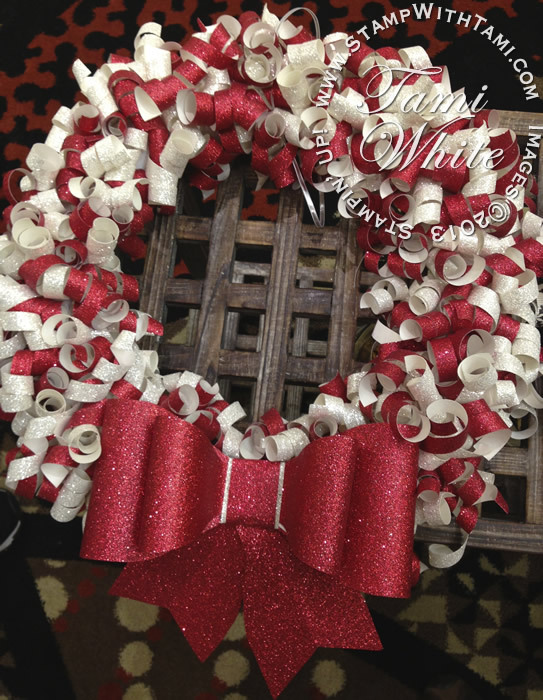 These wreaths look festive and easy! Can’t wait to give them a try. The wreath is amazingly beautiful! I loved this project as soon as you posted a few of the ideas a few weeks ago. Thanks for the great video. You sound so energetic even after curling all of that paper! Love the wreath! made a paper wreath from a kit and although very pretty, did not turn out this great! Thanks for the inspiration, going to make a couple for our entryway and gifts as well. thx so much for sharing so many nice projekts. I so love to watch your Tutorials. Your voice is so cheering. It always makes my day, when there is a new video from you. Liebe Grüße aus Deutschland. Mach so weiter! What beautiful and versatile ideas. Great wreath! You make it look like so much fun! I want to make one too. 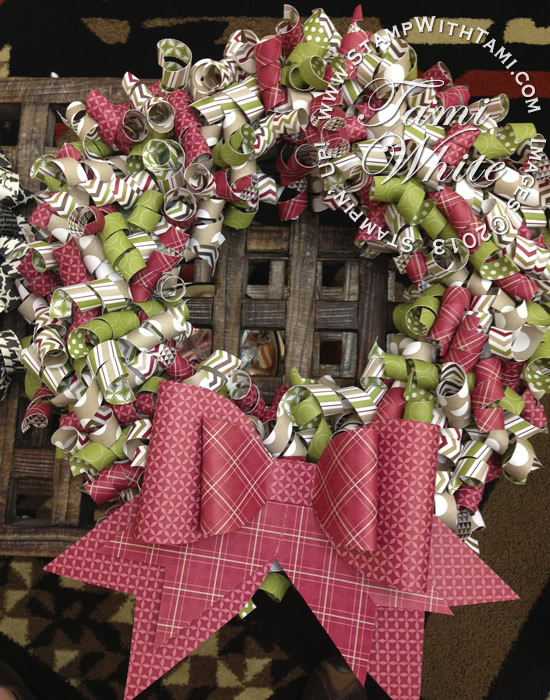 Love these wreaths and all the different tags and bows that can be added. Thanks for a inspiring video! Cool! What an easy and pretty project! I love these wreaths. I think I’ll be making a thanksgiving style one since I have leftover clearance paper that I got last year. Thanks for the idea! Oh my goodness! How beautiful are these??? Gotta give them a try! Thank you for sharing your awesome tutorial!! I hope you don’t mind, but I made one of these already!! 🙂 Gorgeous!! Love the wreath im going to make one for my mother. Im new to stamping and card making I saw your video on you tube with the card that you had a dryer sheet on it .love it going to try that to thanks . These are so beautiful!! 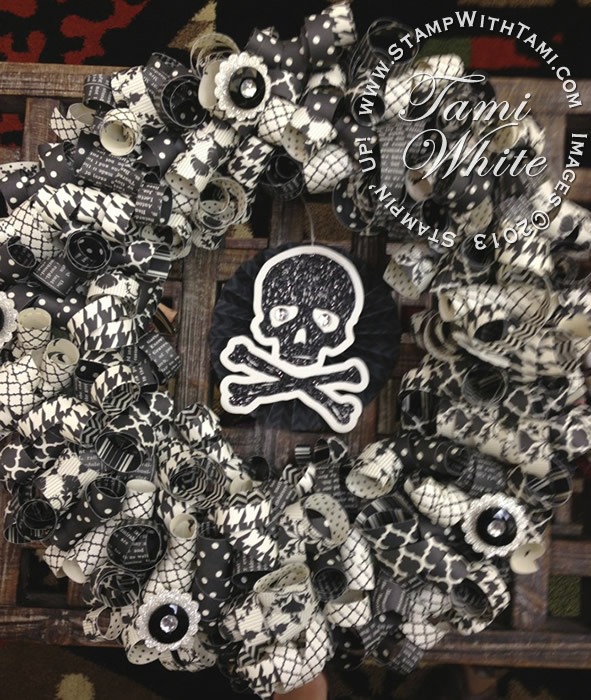 You have such great ideas…absolutely love the Halloween wreath! Just recently started Stampin’ and look forward to creating this festive wreath for Christmas. Luv, luv your videos Tami! 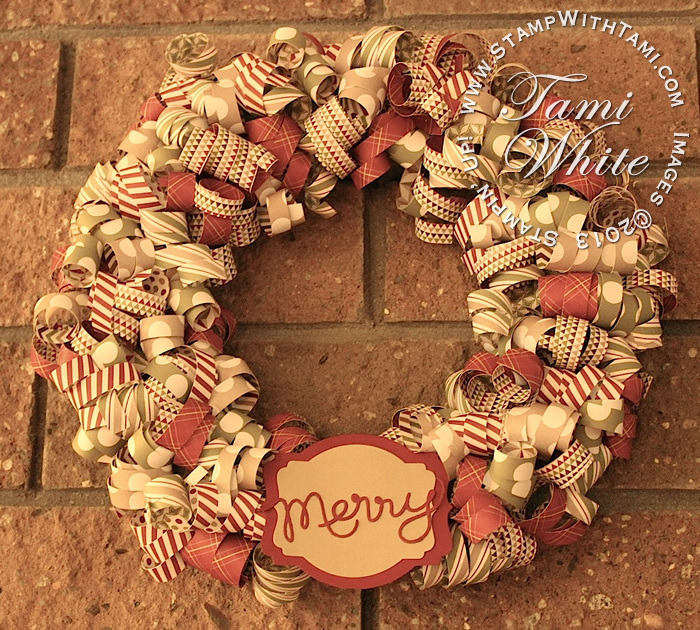 Love this idea…and it can be made for any holiday…. As I watching this, I was remembering a similar project I did as a child. The good ole yarn wreaths! I reviewed the other Holiday styles you used and am now thinking of more ways to put this to use! Birthdays, Baby Showers, Wedding Showers, etc. the ideas are limitless. Thank you for bringing back a fun childhood memory too. I just love the wreath. I have a wall in my home that is all mirror and the Christmas one would look just beautiful on it. Can’t wait to get the styraform wreath tomorrow. Then I can start on it. You do such great work.